Phewit! Hello people! It's been such a long time since my update on the first month of May. I truly truly miss the Good Ol' Days where I can meet up with a bunch of lovely friends met through events and of course, hearing fun stories from them about the blogger community. I've been in and out from the blogosphere and couldn't catch up with a lot of interesting news. It's always been my resolution to update my blog as frequent as possible, but I guess my passion is still in online games TEEHEE! 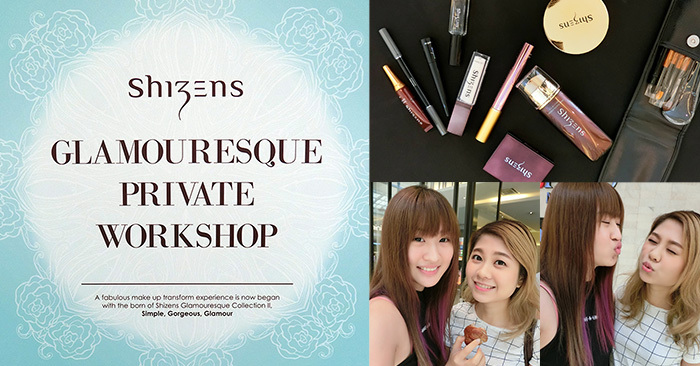 Anyway, enough of babbling, so let me share a little bit on my experience at this Shizens Glamouresque Workshop. It was a workshop to achieve a flawless makeup look with the newly launched Glamouresque Collection II. It wasn't a workshop for bloggers only, but it is also open for public to join. 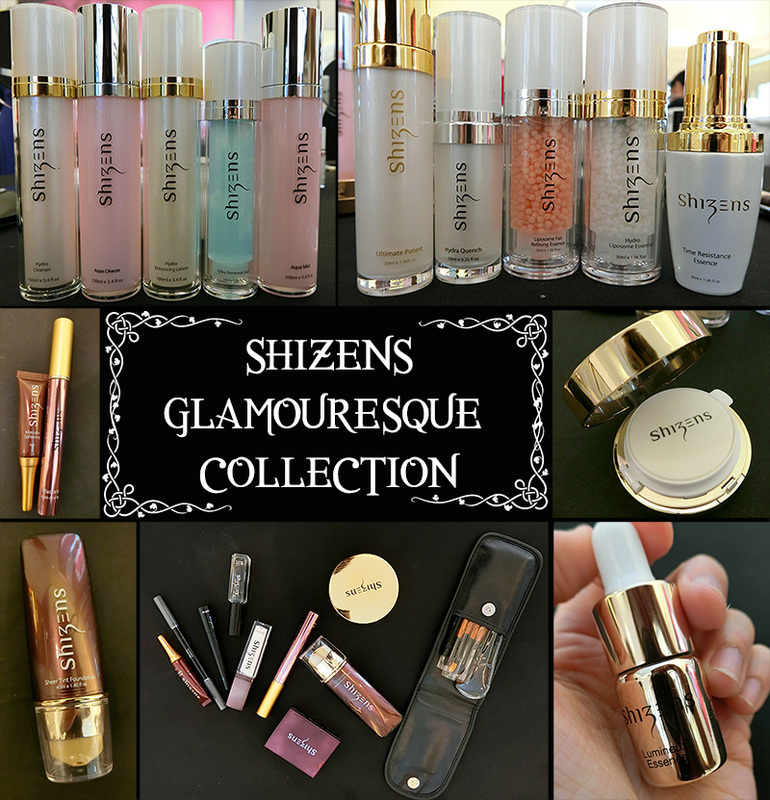 Shizens has a series of makeup products on the market, where they named it the Glamouresque Collection. The second edition has a few new comers, which I will be showing you some of their star products. I've included the most favourite skin care products in the image below, and my favourite is the Hydro Liposome Essence, where the tiny capsules lock the ingredients and instantly release the fresh ingredient once it is being pump out from the bottle. When the fresh ingredients keep in touch with the skin, it will penetrate and boost up the moisture level within the skin layers. Moving on to the cosmetics range. The Glamoresque Collection consists from the base makeup to lip products. Shizen's star product is the Lip Tattoo, which the color changes accordingly to the pH level of your lips. Ultimate Potent is a skin care product. It is designed specifically to have an instant skin lifting effect, evens skin tone that enhances a smoother and more youthful appearance. This mist should be used after the toner and essence, before moisturizer. Yeap, you read it right. It is a mist and after you spray it to your face, gentle pat your face wit h upright direction till your skin fully absorb it. 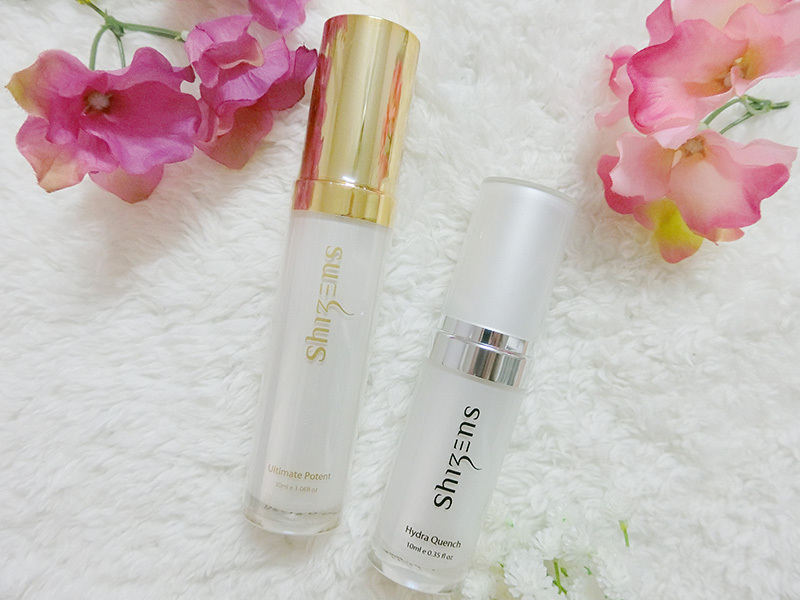 Hydra Quench on the other hand, is a hydrating essence formulated to boost up moisture level for all skin types. Unlike any other essences, Hydra Quench is in clear and watery texture. It works effectively to replenish, keeping and lock-in the moisture needed on our epidermis layer. Sodium Hyarulorate and Gigawhite (7 natural plant extracts) can be found in the essence and works effectively to achieve a hydrating, firming and brightening effects. There's three eye shadows in the Glamouresque Collection. 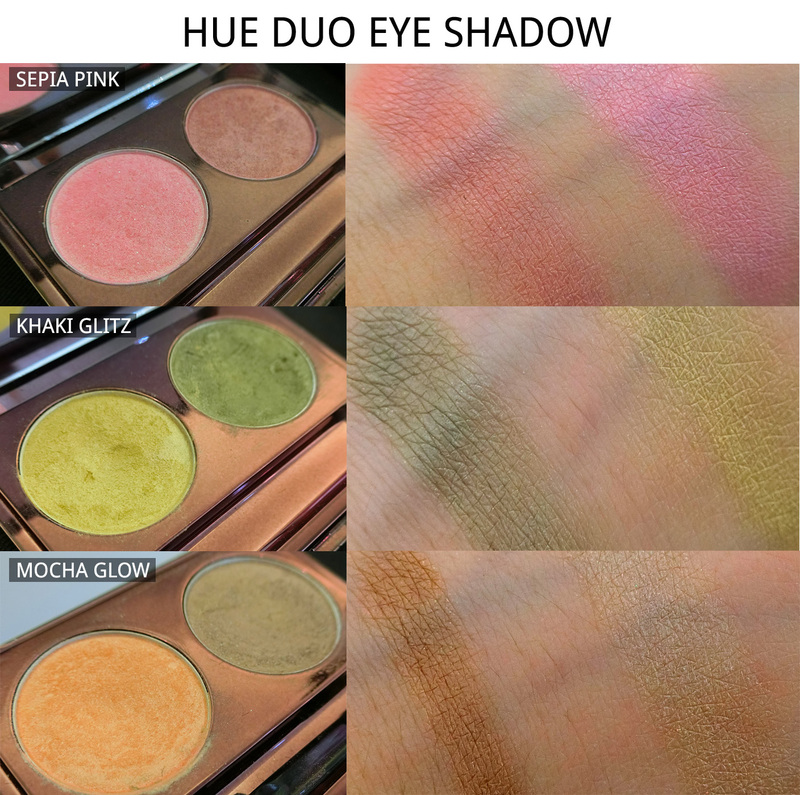 It's a duo-color palette and what makes it interesting is that, if you want the shade to be extremely visible on the skin, wet your brush and dab on the powder for a long lasting and vibrant shade on the skin. Pink Sepia has the sweetest colors among of all and I do think the colors are more vibrant than Khaki Glitz and Mocha Glow. Kah Mon was the model of the day. Kudos to her for taking up this challenge because she has sensitive skin and still up for this shot. 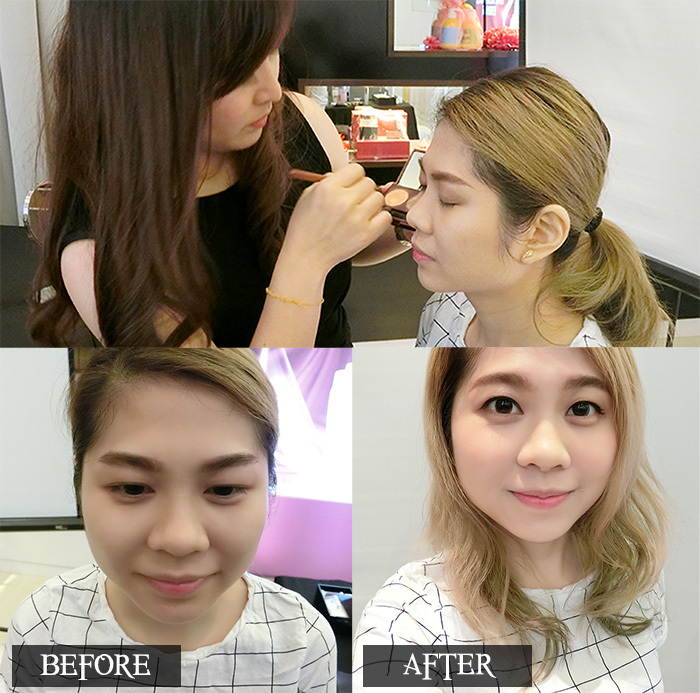 As usual, the workshop taught you the techniques to put on the makeup for a flawless look. I can't give much feedback on how the foundation would work, but judging on how Kah Mon wore it that day, it doesn't really suit dry skin. It would be good to moisturize your skin to the max before applying the foundation.